Bearing in mind my commitment to spending time outdoors, it may not come as a surprise to learn that I never intended to be raising a child in London. In fact, I never even intended to live here myself. For a few years after Mr Techno and I got married, I resisted the idea of moving to London, which was exactly what most of our contemporaries did straight after leaving uni. But eventually it became clear that we needed to be here for the sake of both our careers. After a few awkward months of commuting from Leighton Buzzard, I agreed to the move and we started renting the flat where we still live in August 2013. 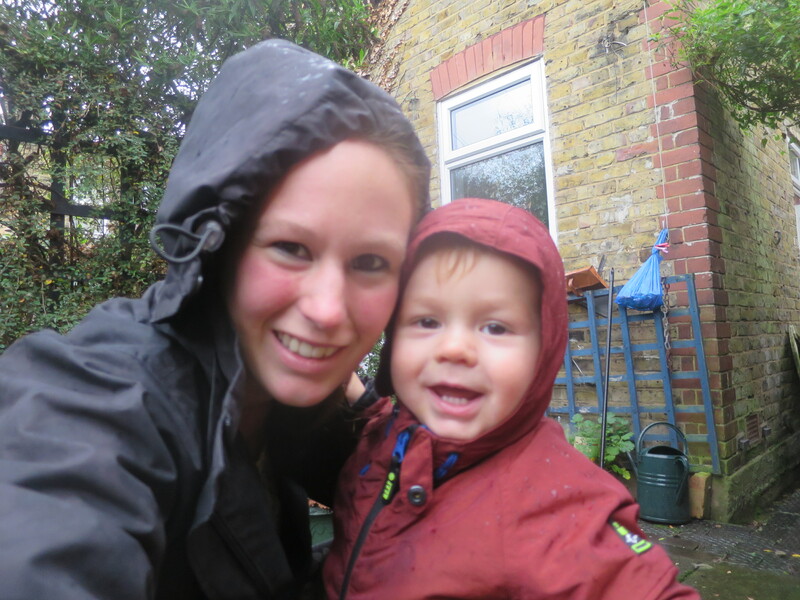 In December 2013, we got a bit of a surprise when we learnt I was pregnant. A very happy surprise, but not one we had planned for! We were lucky that we already lived in a two bed flat (though the second bedroom was being used as a living room), so we were able to stay put. In August 2014, we welcomed Tom. Raising a child in London has both pros and cons, especially when I’m aiming to raise a ‘Wildling’ rather than a city child. 1) It’s easy to get around locally on foot, meaning we get to spend more time outside. 2) Lots of green space. London is one of the greenest capital cities in the world. According to Visit London, there are more than 3,000 parks and open spaces in the city. 3) Good public transport links mean we rarely have to use the car. 5) Endless toddler groups, soft play centres, and other child-friendly activities and events. 6) Easy to find like-minded parents – with this many people around, there is bound to be a group for parents who share your parenting approach. 7) Good choice of childcare. Outdoor space was a priority for us, so having a range of nurseries to choose from gave us the opportunity to find one with the space we were looking for. There are also different options such as Montessori or Steiner preschools for older toddlers. 1) Not much garden space. We are actually unusually lucky in that our flat does have a small garden. But we are on the first floor, meaning we have to go down a steep, narrow staircase to access it. It is also tiny, paved, and acts as a toilet for the local cats. Because we rent, there are limits to what we can do to improve the space. Though it will be my project for this spring. 2) Traffic. Cars, cyclists, even fast moving pedestrians can be hazardous to slow-moving toddlers who are just learning to walk and have little concept of personal safety. 3) Busy wild spaces. Although London does a good job when it comes to the provision of green space, the large population means that you have to share them, especially on warm days and weekends. 4) Limited step-free access. For those of us with buggies, accessing the tube can be difficult and frustrating. Buses are great, but slower. So getting to some areas of the city can be tough. Hey, look at that! Seems like the pros outweigh the cons, at least for the moment. Truthfully, I am really happy with our lives here. It may not be what I planned, but raising a Wildling in London is not as much of an effort as I might have thought before Tom was born. What about you? Do you have an urban family or are you rural all the way? Posted on November 22, 2015 November 27, 2015 by LucyPosted in Outdoors, ParentingTagged East London, London, Outdoors, pros and cons, toddler, urban kids. We live in NW London, but are lucky to have a fantastic local park, with various areas: forest, long grass meadow, walled garden, clipped grass, playground. We also try to take trips as often as possible to rural places and farms, so Little F can interact with nature and animals more freely. It is the most important thing for me that he has good contact with nature. Rural holidays are the best memories from my childhood and I want to give him the same. I hate walking by busy roads, but I have no choice, as Little F is now being trained for when the baby comes in January. He has to be able to walk next to the buggy (or stay on buggy board) while the baby is in the buggy. Those busy roads would worry me too – Tom still goes back in the buggy for them. But its a very good idea to get Little F used to walking safely before he becomes a big brother! We live in Brighton, we moved from East Dulwich. It’s still pretty urban and our day to day life benefits from it, like you said with the groups and activities for the kids. Plus I love that I don’t really have to drive anywhere. I also love that the sea is on our doorstep and the downs are a short drive away so it feels urban but with a mini escape hatch if needed. However, the obstacle course that is the bins on the pavement does drive me pretty crazy. Whenever I start freaking out that it’s too urban for my kids (our garden is actually a Yard-en) I remember loving living near Kingston when I was a teenager and not being dependent on my Mum to drive me everywhere, so I know the girls will love us for it later on! Thats a point. Countryside great for little kids, but not so brilliant for teenagers. One day I d like to compromise by living in a small town. On the sea would be a bonus! Interesting read! We live in a village in Essex and I always wonder how life would be like if we had stayed living in London with kids. There are definitely pros and cons for both. I love our outdoor spaces but sometimes wish I could walk to more shops and cafes! #TheList. It’s always so interesting to read about the way other people live. We’re in a very rural part of the US and although we have big woods behind our house where the kids can play, we’re totally dependent on our cars to get anywhere. I have friends in Stockholm which, like London, is very walkable and has a lot of green spaces. I definitely miss that part about living in the city. It just goes to show that there are pros and cons to living anywhere. my friend is raising a little one in London and is seeing the city through new eyes. New, happy, eyes. We are so luck in the UK that in so many of our urban and suburban areas there are little place of green to mooch about in with the kids. Sometimes it’s because of the kids that we find them. I definitely would never have made so much effort to find all our little green spaces if I didnt have Tom. We are very lucky!